Every August (or even July), the emails begin: “It’s not too late to start your Christmas knitting!” “Five Quick Gifts You Can Make in Your Sleep!” “A Totally Not-Crazy Plan to Make a Fairisle Stocking for Everyone On Your List!” Every year, I resist. Through the chill of autumn, through the holiday gift posts and knitting magazines, I stand firm. Then, sometime in November, I lose my damned mind. “Just a couple of things for the kids,” I tell myself, “and maybe a nice hat for someone. Just a few small things.” I know this is a bad idea, and so I stop myself, and the pressure builds in that small, nagging part of my brain that thinks there are 48 hours in a day and that the whole needing sleep thing is Illuminati propaganda to keep us weak. This really is a bad idea, though. See the hot tensioning mess that is the stitching between the squares? 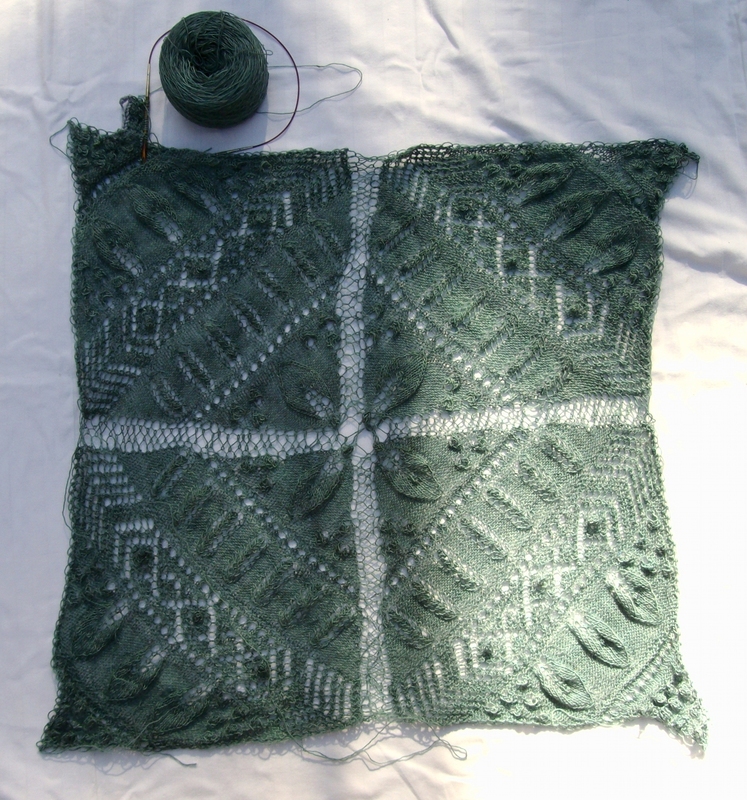 See how I’m knitting the border on in violation of the pattern directions? These things are not unrelated. 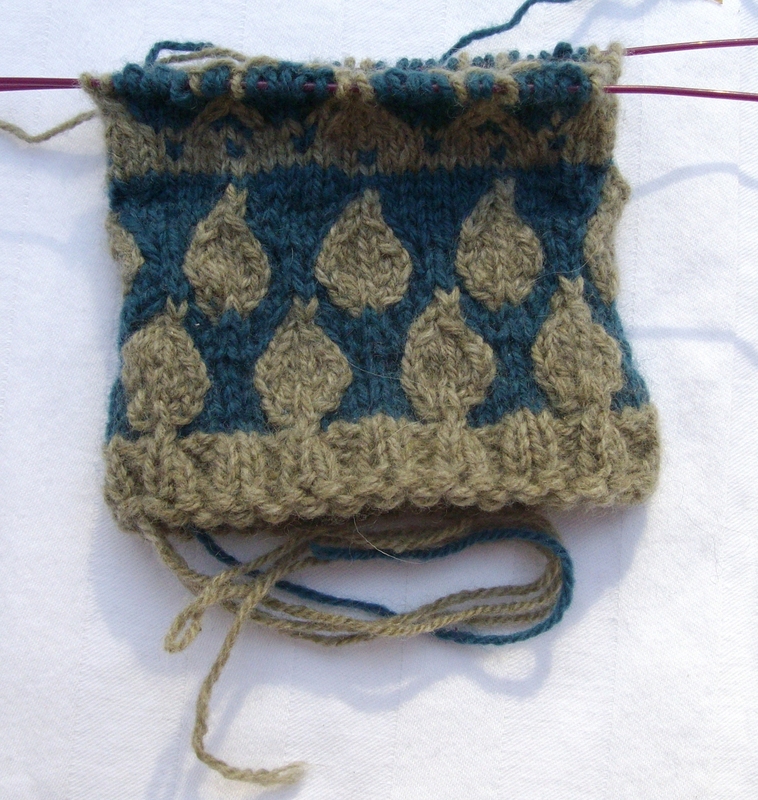 In the fullness of time, this will grow up to be a mitten. This is the first of a pair of mittens for my other sister’s birthday last July (my Let It Be Spring mittens, in Sunday Knits 3-ply for a slightly larger size). I made a mistake and have to tink back, and so it went into the naughty pile to think about what it’s done. (I haven’t even started her ‘big birthday’ present; fortunately we’ve changed what that will be, so I get to hit restart on that while we swatch and decide on yarn. Sometimes procrastination pays off.) Then there are the projects for two babies who were born in September. (I’ll get them done, baby parents. Honest. Hopefully before the children are too big to want them.) Plus, there will be another baby in the family next spring. Fortunately, all the recipients are great, knit-worthy people who understand that when I say I’ll make something, it may take a while, as by day I am a monogamous knitter, and so am a fickle, fickle butterfly when it comes to recreational knitting. Which is why this year I am not knitting presents. Well, maybe a hat for Dad. But only because I’ve spun the perfect yarn for it, and have some indigo to dye it with. That’s it, though, I swear. Goll-EE, I love you so very much, Elizabeth! The feeling is definitely mutual, Sherry! I am so proud to have been able to obtain the monsters for the Speck! You are overwhelmed with (beautiful) projects. It was a pleasure — I was honoured to get the commission!